NEW RETREAT DATES WILL BE ANNOUNCED SOON. REGISTER HERE TO BE THE FIRST TO KNOW! Thank you! Look out for an email announcing new dates for The Retreat soon. You’ll be the first to know! 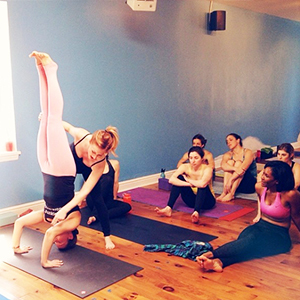 Trained in 2012, I am a 200 hour certified yoga teacher living in Pittsburgh, PA.
For me, yoga takes on many forms. It can be heart pumping, soul healing, deeply soothing and intensely challenging at all once. It pulls me in and teaches me things when I least expect and when I think there is nothing left to learn from it. When I turned 25, yoga led me to be more aware of my body and and through this awareness, to a rheumatoid arthritis diagnosis, which despite its challenges, has changed my lifestyle and overall health for the better. I’ve customized my practice to fit my body’s strengths and weaknesses and I am constantly inspired by how many of us overcome our struggles, both physical and emotional, on our mats. This has undoubtedly influenced my teaching, which is very much the opposite of arthritic. I teach upbeat flows with less emphasis on perfecting movements and much more on allowing the practice to flood our bodies and take on its own shape. I want the practice to feel methodical and rhythmic, with vulnerability and honesty, so we can find those qualities both with others and with ourselves. I have taught at Solstice in Times Square, led #AerieREAL classes around the country, and hosted international retreats. But no matter where yoga takes me, my favorite place to teach is in Pittsburgh surrounded by my community of students, who make me profoundly grateful for this practice and the friendships it fosters. Represent Aerie and shared the #AerieREAL message at the Solstice in Times Square on the longest day of the year in both 2016 and 2017. Twelve thousand yogis from all around the world came to their mats and it is always an honor to lead this empowering flow. 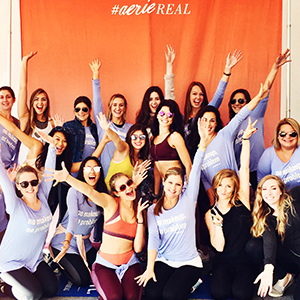 Traveled to Boston and Chicago for Aerie's Chill Play Move Pop-Up Shop and shared my #aerieREAL story with 150 Aerie yogis in each city, encouraging body positivity, self love, and personal empowerment. This workshop that focuses on fast flows set to upbeat music and candlelight. Mixing breath & beat, the students cycle through a long sequence together before flowing through it on their own. 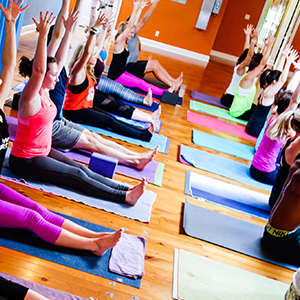 Transform studios into glow in the dark yoga parties. Mantras painted on the walls, black lights, glow sticks, and balloons turn this vinyasa flow into a less serious expression of yoga. Glow with the Flow gives yogis the opportunity to lose their inhibitions, find the fun in their practice, and sing along to Justin Beiber in their neon yoga pants. Cultivate community for regular students and creating a welcoming space for new students in accessible heated vinyasa classes. Classes are taught in-the-moment, tailored to the students that day. Class sizes range from 20 to 65 students, depending on the studio. 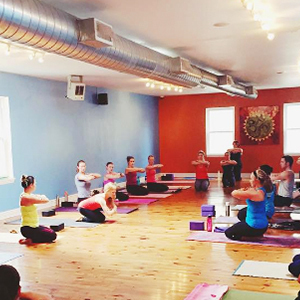 Led a hot and sweaty yoga class on Walnut Street in Shadyside, a collaboration between Lululemon and Amazing Yoga. Students rolled out their mats in an atypical place to show the community we live our yoga loud and proud. 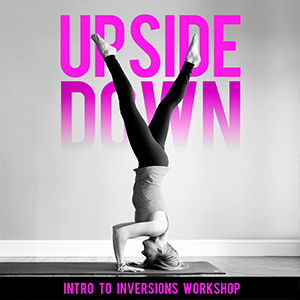 Break down the core inversions in a two part workshop series: Intro to Inversions and Next-Level Inversions. Students learn to go upside and tackle their fears while we focus on headstands, forearm balance and handstand, while overcoming the fear of not only going upside down but also forcing ourselves out of our comfort zones. Assist and co-facilitate teaching trainings and yoga retreats in magical Tulum, Mexico and adventurous Costa Rica. Think sun, sand and a whole lot of yoga. 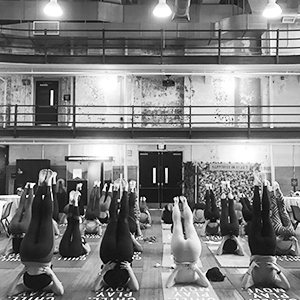 Taught a class for the Aerie HQ team to kick off the 2016 Aerie corporate offsite at the Ace Hotel Pittsburgh. It was an honor to give back to women who love what they do and spread body positivity to women each day.